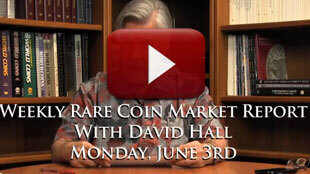 PCGS Newsletter: Why do you collect coins? We are giving away a FREE Uncirculated 1924 Peace Dollar Graded PCGS MS64 in a special holder with a retail value of $100 to one of our readers. The Winner is Jeffery Hill from Ohio. All winners need to be active PCGS eZine eCollector subscribers to be eligible for the prize drawing. The winner must email or call PCGS Customer Service within 30 days of initial notification or he/she forfeits the prize. As always, let us know how you are enjoying the PCGS Newsletter. What coins are you shopping for this summer? The 1803 $10 Extra Star Reverse is an unusual variety with an unlikely "surprise" in the final cloud on the right of the reverse. There, a mint engraver impressed a clear, tiny star just right of center. The star is visible and obvious on well-struck, unworn examples, but becomes indistinct on worn coins and may not be visible at all on a poorly struck example. Why do you collect coins? Why do you collect coins? Is it because of beauty, design, rarity, or do you simply need it to fill a hole in your set? Do you ever buy coins that you know very little about? Are you a compulsive buyer or do you have the discipline to thoroughly evaluate each coin and only buy if it fits into your predetermined collecting plans? Every year the U.S. Mint strikes billions of coins for circulation. And once in a big while, the Mint inadvertently lets a few Mint Error coins escape. Error coins are one of the most exciting parts of the market as they attract many new collectors every year. Many new collectors discover coin collecting thinking they hit the jackpot by finding a rare mint error coin in circulation. Way back in the day, long before America became the United States, colonists in the Massachusetts Bay Colony (later Massachusetts) arranged to strike their own silver coins. The first were the “New England” shillings, sixpence, and threepence, all of which were undated but struck in 1652. These were simple disks of silver with the monogram “NE” punched on one side and the denomination (in Roman numerals) punched on the other. PCGS Collectors Club Members (and one guest) can attend the Long Beach Expo for FREE. Pre-register on the Long Beach website. The Long Beach Coin, Stamp & Sports Collectible Expo is held three times each year. The next Expo starts June 6, 2013. With few exceptions, commemorative coins of the United States of America deals with notable historical events, government institutions, parks and monuments, the military and sports. This is, of course, perfectly fine. It covers a large spectrum of what makes the USA the USA. However, I can't help but feel that American culture is not adequately being celebrated as it should be on U.S. coinage. © 2013 PCGS, Inc. A Division of Collectors Universe. All Rights Reserved. P.O. Box 9458 Newport Beach, CA 92658 • 1 (800) 447-8848 (USA) or +1 949 833 0600 (International). For advertising info contact Rebecca Tran, Director of Advertising at [email protected] or 949-567-1356.